I have a few more cards that I created with the Our Daily Bread Designs August 2016 Release stamps that I wanted to share and this card was designed with the new ODBD By The Sea stamp set along with the ODBD By The Shore Collection 6x6 Paper Pad. I love the pelican image along with the verses and sentiments in the ODBD By The Sea stamp set as well as the new By The Shore Collection 6x6 Paper Pad- so many fabulous summer scenes and paper pattern designs! Psalm 62:1 "My soul finds rest in God Alone" is so comforting to me! As I have mentioned in previous posts, my husband Dave and I enjoy watching birds- we find that enjoying nature and God's masterpiece of creation allows us to "Rest in Him" for sure! I am linking this card up to the Word Art Wednesday #246-#247 “Anything Goes”Challenge and the Splitcoaststampers’ MIX173 “Frame It” Challenge. 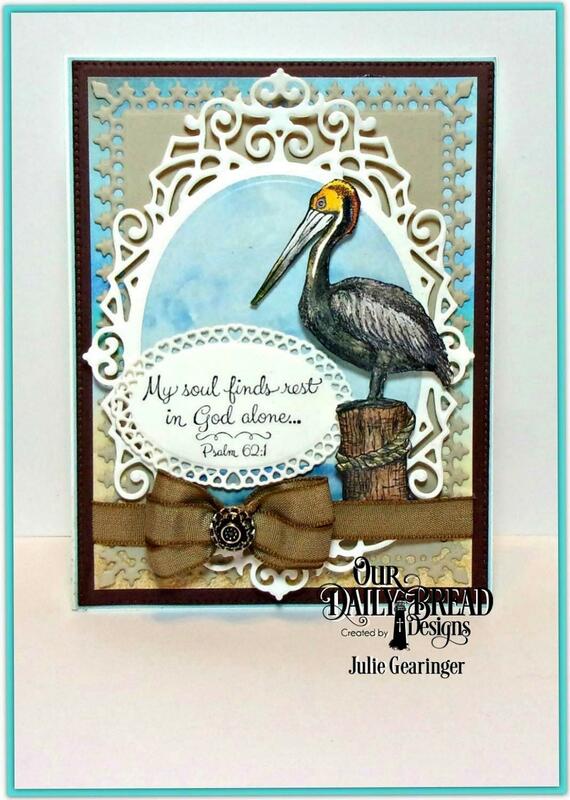 I think that the large die from the ODBD Ornate Ovals Dies makes a very nice frame for the pelican, don't you? If you have not had a chance to visit the Our Daily Bread Designs Blog or the two challenge sites yet, I encourage you to do so- gorgeous inspiration from all! Die cut and emboss a piece of dark brown cardstock with the ODBD Flourished Star Pattern Die, mount onto a piece of sky blue cardstock, trim close to the die cut and mount onto the white card base. Die cut and emboss a piece of sand cardstock with the ODBD Lavish Layers Dies, mount onto a piece of the ODBD By The Shore Collection 6x6 Paper (die cut and embossed with the ODBD Rectangles Dies) and set aside. Die cut an oval from the ODBD By The Shore Collection 6x6 Paper (I used the sky area) with the ODBD Ovals Dies and mount this oval onto a die cut a piece of white cardstock (die cut and embossed with the largest die from the ODBD Ornate Ovals Dies). Stamp the sentiment from the ODBD By The Sea stamp set with archival black ink onto white cardstock, die cut and emboss with the ODBD Layered Lacey Ovals Dies and mount onto the layered panel created in the above step. Ink the pelican image from the ODBD By The Sea stamp set with archival black ink, stamp onto white cardstock, color with watercolor pencils (adding just a bit of water and applying layers of color for more dimension), fussy-cut the image and mount onto the layered panel with dimensional foam. Adhere the triple taffeta ribbon bow along with the antique brad in the center (wrap the ends of the ribbon behind the panel) and mount the entire panel onto the card front. Add a white highlight to the pelican's eye with a extra fine white paint pen and use a clear glitter pen to add glitter to the feathers (difficult to see this both in the photo) to finish off the card. This is gorgeous, Julie. I love how you've combined these awesome stamps and dies to create such a beautiful scene. Thanks SO MUCH for stopping by to play along with us. It's always such a blessing to have you play along.